I grew up on Dr. Seuss books and as a child I loved the way he depicted trees. They looked so funny – weirdly shaped and strangely colored. Sometimes Ted Geisel illustrated them in green, but more often they were done in fun, unusual colors. I loved seeing yellow, pink, white, purple and red trees while I learned to read. 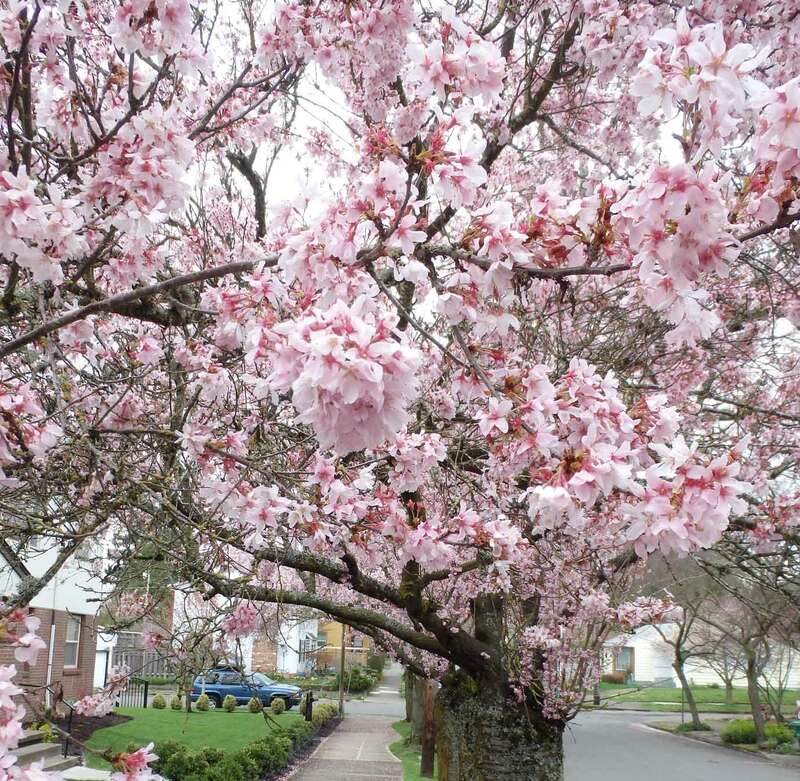 Decades later I moved from Pennsylvania to Portland, Oregon, a city where March and April bring an explosion of trees that are yellow, pink, white, purple and red in flowering bloom. Just like in those books. It’s “The Time of the Dr. Seuss Trees”, an amazing display of life, springtime wonder and wild color. A time when trees appear to be other than what I take them to be and become extra-ordinary. The tree outside my office window isn’t the ordinary green of summer – it’s BRIGHT RED! A red tree like the ones in the books. And that one over there is thick, bright, psychedelic pink for two weeks. And over there, two weeks of electric yellow. And then, it’s ordinary again. Just green. Or, is it? The Dr. Seuss trees remind me of how much there is to know and experience when I look beyond the surface. Awe and mystery are always there, ready to prompt a deeper look and appreciation for things; ready to inspire feelings of opening up, broadening, and curiosity towards life and the world. Awe can inspire feelings that go along with win-win. In the awe and opening up, my aches recede into the background and my life becomes more rich, even if only for a little while. The experience of awe has been studied in the arts, philosophy, and in humanistic studies. A search for the keyword “awe” at my local library turned up dozens of titles referring to the emotion of awe. One of those dozens is “Awakening to Awe” by Existential-Humanistic therapist and author Kirk Schneider. “Awakening to Awe” tells the story of people who transformed their lives through the cultivation of awe and the changes that awe provoked. Much of the story is told in the format of interviews that span a range of very different lives: an academic, a gritty comedian, a former gang member, and a recovering addict round out the list of lives transformed by awe. It takes all kinds and includes all kinds. “Awe-based awakening is fundamentally an attitude, natural and free to all,” Schneider writes. Awe, he tells us, encompasses two modes of consciousness: wonder with its fascination and allure, and “unsettlement” with the apprehension and fear that being unsettled evokes. What happens when I blend those two together and shake well? All manner of things, including the possibility to be profoundly moved by the experience. At its best I think that awe expands my perception beyond fixed or assumed/doctrinal lines and into a more broad and a deeper context. Where previously I might have been inclined to be dismissive or rigid, I might instead consider things more broadly or more thoughtfully. That “broadening” can make a great difference in outcome whether I’m relating inwardly within myself or to the world around me. The feelings that accompany broadening are positive and pleasurable in themselves – and like Dr. Seuss, they’re fun! They promote interest and curiosity in the world and lead me to add resources to my life that increase my possibilities. And that can make a big difference. The notion of broadening has been studied by Barbara Fredrickson and her team at the University of North Carolina. They contrast broadening with the narrowing and protective effect of negative feelings, and point out that our tendency to become broad-minded, exploratory and curious during positive feelings has been responsible for all manner of constructive and life affirming developments in human culture. Fredrickson has been roundly criticized for the math and data behind her “positivity ratio” (differential equations, anyone? ), but math aside, I do find their “Broaden and Build” conclusions credible. I see a linkage between awe and the constructive and life affirming elements of human cultures. 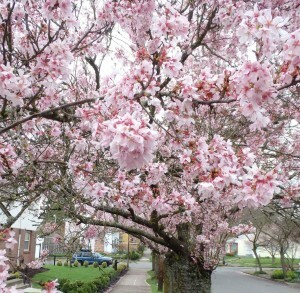 This spring season you might try surrendering to awe. 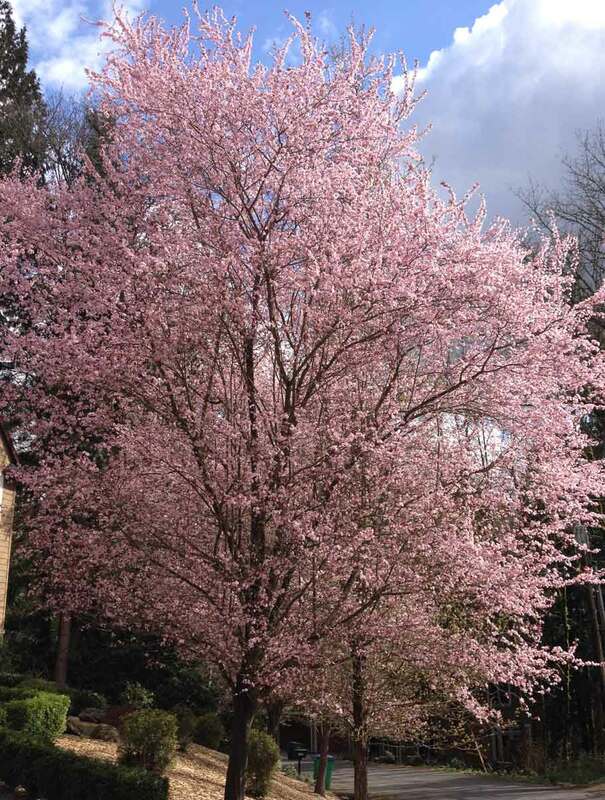 Pink trees can lead to awe and mystery and then to broadening and deepening. Which might take you to something positive, expansive and good. Perhaps a difference so enduring that it will be called transformation. Grey, wintry branches bursting into bloom. You can read more about “Awakening to Awe” on Kirk Schneider’s website: http://kirkjschneider.com/book-awakening-to-awe.html. This entry was posted in Existential, Practical Tips, Self and World, Well-Being on March 21, 2014 by Stephen.